Today in the clubhouse we're getting terrific and scientific! Let's Goers tell us why they love science, computing and robots. Browse content similar to Super Science and Total Techno-Fun. Check below for episodes and series from the same categories and more! I'm Joanna, and these are my friends Kirsten and Martin. -We want you to come and join us, too! Today in the clubhouse, we're getting terrific and scientific. Let's Goer Natasha shows us what it's like to be an inventor. We're going double-digital with facts about computers and robots. Our CBeebies friend Dr Ranj is in the clubhouse. Hi, my name is Natasha. This is my cat, Griselda. -..and I love cuddling all of them. I love jumping high on my trampoline. I play the violin and the flute. But there's one thing I really love - science. I really love doing experiments at home with my mum. It's fun to watch the chemical reactions. I want to be a marine biologist when I grow up. I love learning about animals. I love using my microscope to look at things up close. I also really like inventing. These are some of the things I've invented. -This is the pollen shoe. and when you walk it spreads the pollen. This is the nose scratcher. that goes up and scratches you on the nose. it looks like you're picking your nose. People say, "Yuck, you're picking your nose,"
and it'll come up and itch your nose for you. -And no-one will know that you're really itching your nose? I like finding out how things work. Sometimes, I make robots with my mum. This is Lizzie - she's a robot lizard. Look at what she can do. Now then, Let's Goers, I bet your brains are buzzing with ideas. You know, I've always fancied invented something. Ta-da! May I present the round of applause stick? -Now, I can clap myself. Thank you. Thank you very much. That's enough of that. So we take our cup of water. And we place our non-breakable tray over the top of it. And make sure it's in the middle. Then, we take a cardboard tube and put that on top, too. And that goes in the middle as well. on its side on top of the cardboard tube. OK, here comes the exciting bit. So I'm going to need an audience. Hey, Willow, hey, Rowan, hey, Francesca. my tray a strong tap, but not too hard. my egg should fall into the water. It landed in the water. It did land in the water. That's what I call an EGGcellent experiment. When the tray is gone, there's nothing to hold the egg up. Gravity pulled it down into the water. I think I deserve a round of applause. Thank you. "You're welcome, Kirsten." Do you dare to take on the daring egg drop challenge? because it could get messy. Make sure you send us your sciencey photos and videos as well. it's time for some fun facts about robots and computers. robots was a steam-powered pigeon. wanted to learn more about how birds fly. So he built a robo-bird. The robot pigeon could fly the length of two football pitches. couldn't take off again to fly home. It had run out of steam. Next, the very first computer was heavier than an elephant. The computer was Colossus and was as big as a bus. top-secret jobs - cracking codes and finding out spy information. Next, there are robots on the planet Mars. That is out of this world. and months to get to the Red Planet. more about Mars and find out if anything lives there. so they are stuck on another world forever. It's a good job robots don't get lonely. And, finally, in South Africa, traffic lights are called robots. Let's put the brakes on. telling cars when to stop and when to go using hand signals. Then, electric traffic lights were invented. so people started calling the lights robot policeman. And, over time, this name was shortened to just robots. That's red, amber and green for go-bot. A steam-powered pigeon? What a hoot! Now, there's a doctor in the house. 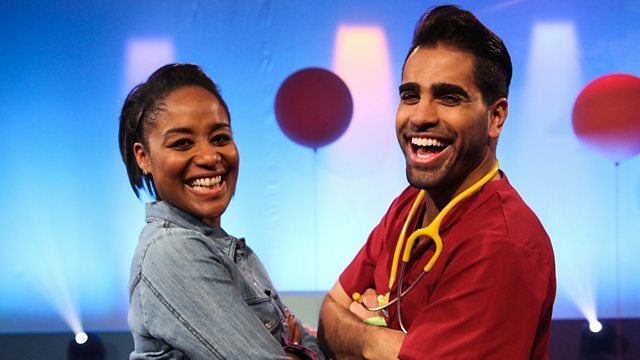 It's Dr Ranj! that you've got some questions for me? We have been having a bit of a think. Harriet, you had a good question. Why do people sneeze when they have hay fever? they release pollen into the air. Usually, that pollen doesn't cause problems. and tickles. That's what makes you sneeze. -Have you got a question as well, Scarlett? Why do people wear plaster casts when they break a bone? your body can mend it again. you glue them back together, that's what your body does. it holds them together so they glue together in the right way. Isla, did you have a question? -How small are germs? How do they make you ill? Well, germs are tiny. Smaller than the eyes can see. something called bacteria and something called viruses. They're everywhere, all around us, and some are inside us. and the bad germs make us poorly. something called an infection, and that's what makes us sick. Our bodies are really good at fighting them off. Sometimes, we need medicine to help us. Dr Ranj, I've got a question. This little bone in your elbow, when you hit it and it feels funny? Why is it called a funny bone? Why's it feel like that? A funny question, because that isn't even a bone. the nerve you hit, and that's what makes it go weird and numb. And makes you feel funny. But it's not the bone, it's a nerve. I had no idea. That was really great. I feel like I've learnt something. when I was eating my breakfast this morning. They were some great questions, Let's Goers. -Thanks for having me in your clubhouse. Now, I've got a fact for YOU. Did you know that you can use two books to have a tug-of-war? with some science-loving Let's Goers. my friends Olivia, Billy and Sophia. We love science, and today we're going to do some experiments. Today, we're going to learn about friction. Friction is the force between two surfaces that are sliding. Or trying to slide across each other. When things are smooth, there's less friction. When things are rough, there's more friction. because it's on a bumpy surface. Which is what happened next. before they get too hard to separate. it is quite easy, isn't it, because there's not much friction? More pages on. 19...and 20. OK, try and pull it apart. of different pages, it is very hard to separate them. We can't pull apart these books. We need to super-size this experiment and get some help. together only by their pages. We are going to try and pull them apart. between the papers add up to lots of friction. We love science, and We Did This. There you have it - science fact, not science fiction. I'll never look at a book the same way again. It's the Club Dance. We love doing this. You can join in, too. you're going to want to show off. Let's get our little friends in. Let's go, Let's Goers. -Let's see what you got, Let's Goers. -Oh, yeah, lovin' those moves. Don't forget our Cool Move. Grab a grown-up, click on the Let's Go Club. Remember, we're the club that never closes. Today in the clubhouse we're getting terrific and scientific! Let's Goer Natacha tells us why she loves science and inventing - from marine biology to mechanical dinosaurs! Our CBeebies friend Dr. Ranj from Get Well Soon is in the clubhouse to answer some questions from curious Let's Goers. And we're going double digital with animated facts about computers and robots. Let's Goer Subhan and his friends use some super-cool science to have a tug of war with a difference in We Did This. And Kirsten has a gravity-tastic Eggs-cellent Experiment - the Egg Drop Challenge! Plus everyone's favourite singing and dancing with the Get Set, Let's Go! song and a boogie-brilliant Club Dance.